After a difficult decision-making process, the RMS is proud to announce the winners for 2018, spanning all microscopy techniques and applications. A new series of Medals was launched by Royal Microscopical Society in 2014 to coincide with its 175th anniversary. The series is designed to recognise and celebrate individuals who make outstanding contributions to the field of microscopy across both the life and physical sciences. Cyrus F. Hirjibehedin has made outstanding contributions to the field of scanning probe microscopy (SPM) through his study of atomic-scale quantum nanostructures, revealing new insights into low-dimensional systems. As a Professor of Physics, Chemistry, and Nanotechnology at University College London (UCL), Dr Hirjibehedin applied SPM techniques to study how the local environment affects the properties of quantum nanostructures at the atomic scale. Results from his group are at the forefront of using SPM to study quantum phenomena at the interfaces of atomic layered materials, including novel Dirac materials like silicene as well as thin, polar insulators like copper nitride and sodium chloride. In recent papers in Nature Nanotechnology and Nature Communications, his group has explored how electronic coupling mediated by atomically thin insulators or molecular ligands can be used to tune the properties of a quantum spin system, enable novel forms of charge and spin transport (like magnetoresistance) through an atomic or molecular spin, and even induce bistable polarization in atomically-thin layers of rock salt. Dr Hirjibehedin has also applied SPM techniques to gain new insights on low dimensional systems, ranging from defects in traditional semiconductors like silicon to novel layered materials like graphene and silicene, including recent work published in Advanced Materials showing that silicene domain boundaries are a novel template for molecular assembly. 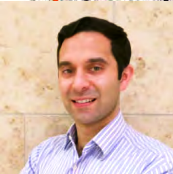 Very recently, Dr Hirjibehedin has moved from UCL, while retaining an Honorary Professorship, to join the Quantum Information and Integrated Nanosystems group to apply his expertise in the field of quantum computing. The work that Dr Hirjibehedin has done at UCL built on his experience as a post-doctoral research assistant in the group of Dr Don Eigler and Dr Andreas Heinrich at the IBM Almaden Research Center. There, Dr Hirjibehedin pioneered the application of SPM to create spin systems with atomic precision and to perform inelastic electron tunnelling spectroscopy on them. This powerful way of accessing collective, low-energy spin excitations in artificially engineered nanostructures has revolutionised scanning probe studies of magnetism. Today, many world-leading groups utilise this uniquely powerful spectroscopic technique that is analogous to electron spin resonance yet applicable with single atom resolution – work that has received over 1000 citations – to study a broad range of quantum magnetic phenomena. At IBM, Dr Hirjibehedin also contributed to outstanding progress in the development of combined scanning tunnelling microscopy (STM) and atomic force microscopy (AFM) studies of atomic manipulation that directly measured the force needed to move an individual atom across a surface. Internationally recognised as a leader in the SPM community, Dr Hirjibehedin has given invited talks at 58 conferences, including 2 plenary and 4 semi-plenary/keynote talks, as well as 89 invited seminars, including 10 colloquia, at universities, government research laboratories, and private companies around the world; he is also a member of the Programme Committee for the 2018 International Conference on Nanoscience + Technology (ICN+T), one of the preeminent conferences in the fields of scanning probe microscopy as well as nanoscience and nanotechnology. In the last few years, Dr Hirjibehedin has written “News & Views” articles in Nature Physics and Nature Nanotechnology to provide insights and perspectives on new work in the field of spinsensitive SPM, and was the guest co-editor for a special section in the Journal of Physics: Condensed Matter highlighting recent advances in SPM. From 2010-2017, he also served on the Scientific Committee for the Advanced Microscopy Laboratory in Zaragoza, Spain, providing external advice for their SPM group. Dr Hirjibehedin has played a leading role in both the development of SPM techniques for the fabrication and spectroscopy of atomic-scale electronic and magnetic systems as well as in advancing the understanding of quantum nanostructures.